RENOVATION & HEAT INSULATION OF BUILDINGS - TBM SERVICE Ltd.
Two or eight centimetres thickness of the entire system? 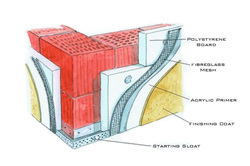 Structural, polymeric or general plaster? One or two first coats? With or without preliminary ground-coat application on the façade? Various combinations of questions and answers arise. And while the client becomes an expert in the area of heat insulation, someone has offered a lower price and this has led to the end result. Cracking of the ground coat starts after one or two winters, as well as complete ripping off of the reinforcing mesh or falling of individual sheets. While the actual price is about 45 BGN per square meter, many “experts” offer the service for 25 BGN per square meter (labour and materials). For me, as a person engaged in this industrial branch, the following questions remain: What materials is an order fulfilled with for such a price? What is the quality of performance? Does the worker giving this price offer a long-term warranty for the investor, and does he observe the safety standards, adopted in industrial alpinism? 5. Finish coat without a mesh. The conservation paints and plasters shall be additionally negotiated based on the choice of the investor.